It is very likely that 2017 will be one of the three hottest years on record, with many high-impact events including catastrophic hurricanes and floods, debilitating heat waves and drought. Long-term indicators of climate change such as increasing carbon dioxide concentrations, sea level rise and ocean acidification continue unabated. Arctic sea ice coverage remains below average and previously stable Antarctic sea ice extent was at or near a record low. The World Meteorological Organization’s provisional Statement on the State of the Climate says the average global temperature from January to September 2017 was approximately 1.1 degree Celsius above the pre-industrial era. As a result of a powerful El Niño, 2016 is likely to remain the warmest year on record, with 2017 and 2015 being second and/or third. 2013-2017 is set to be the warmest five-year period on record. The WMO statement—which covers January to September—was released on the opening day of the United Nations climate change conference in Bonn. It includes information submitted by a wide range of UN agencies on human, socio-economic and environmental impacts as part of a drive to provide a more comprehensive, UN-wide policy brief for decision makers on the interplay between weather, climate and water and the UN global goals. “The past three years have all been in the top three years in terms of temperature records. This is part of a long term warming trend,” says WMO Secretary-General Petteri Taalas. We have witnessed extraordinary weather, including temperatures topping 50°C in Asia, record-breaking hurricanes in rapid succession in the Caribbean and Atlantic reaching as far as Ireland, devastating monsoon flooding affecting many millions of people and a relentless drought in East Africa. “Many of these events—and detailed scientific studies will determine exactly how many—bear the tell-tale sign of climate change caused by increased greenhouse gas concentrations from human activities,” he says. Extreme events affect the food security of millions of people, especially the most vulnerable. A review of the Food and Agriculture Organisation (FAO) found that, in developing countries, agriculture (crops, livestock, fisheries, aquaculture and forestry) accounted for 26 per cent of all the damage and loss associated with medium to large-scale storms, floods and drought. According to the World Health Organisation (WHO), the global health impacts of heat waves depend not only on the overall warming trend, but on how heat waves are distributed across where people live. Recent research shows that the overall risk of heat-related illness or death has climbed steadily since 1980, with around 30 per cent of the world’s population now living in climatic conditions that deliver prolonged extreme heat waves. Between 2000 and 2016, the number of vulnerable people exposed to heat wave events has increased by approximately 125 million. The latest International Monetary Fund (IMF) World Economic Outlook indicates that adverse consequences are concentrated in countries with relatively hot climates and which are home to close to 60 per cent of current global population. "The temperatures in 2017 is the highest for a non-El Nino year ever seen, much above the levels seen in 2014, which was the previous highest. The reductions in per capita productivity and income related to the increase in temperatures are leading to a global north-south divide with the south being affected negatively by up to 4 per cent and the global north benefitting marginally from the warming," says Petteri Taalas, Secretary General of the WMO. "Although emissions have reduced and emissions from energy have remained constant, carbon concentrations in the atmosphere and temperatures will continue to rise rapidly for the next 50 years unless dramatic cutbacks are made to mitigate the situation," adds Taalas. All-India rainfall for 2017 monsoon season (June to September) was 5 per cent below average. However, above-average rainfall in the northeast and adjacent countries led to significant flooding. Global sea surface temperatures are on track to be among the three highest on record. Global ocean heat content in 2017 to date has been at or near record high levels. Elevated tropical sea surface temperatures which contribute to coral bleaching were not as widespread as during the 2015-16 El Niño. But some significant coral bleaching did still occur, including the Australia’s Great Barrier Reef. 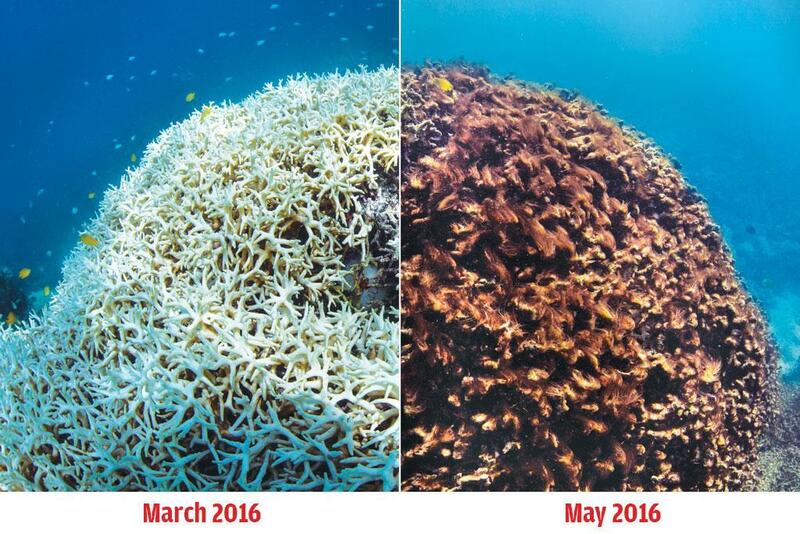 UNESCO reported in June that all but three of the 29 coral reefs with World Heritage listing had experienced temperatures consistent with bleaching at some point between 2014 and 2017. According to the Intergovernmental Oceanographic Commission of UNESCO the ocean absorbs up to 30 per cent of the annual emissions of anthropogenic CO2 in the atmosphere, helping to alleviate the impacts of climate change on the planet. However, this comes at a steep ecological cost, as the absorbed CO2 changes acidity levels in the ocean. Since records at Aloha station (north of Hawaii) began in the late 1980s, seawater pH has progressively fallen, from values above 8.10 in the early 1980s to between 8.04 and 8.09 in the last five years. Three major and high-impact hurricanes occurred in the North Atlantic in rapid succession, with Harvey in August followed by Irma and Maria in September. Harvey made landfall in Texas as a category 4 system and remained near the coast for several days, producing extreme rainfall and flooding. Provisional seven-day rainfall totals reached as high as 1,539 mm at a gauge near Nederland, Texas, the largest ever recorded for a single event in the mainland United States. It was the first time two Category 4 hurricanes (Harvey and Irma) made landfall in the same year in the USA. Irma had winds of 300 km/h for 37 hours – the longest on the satellite record at that intensity and spent three consecutive days as a Category 5 hurricane, also the longest on record. Like Irma, Maria also reached category 5 intensity and caused major destruction on a number of Caribbean islands. In mid-October, Ophelia reached major hurricane (category 3) status more than 1,000 kilometers further northeast than any previous North Atlantic hurricane. It caused substantial damage in Ireland, whilst winds associated with its circulation contributed to severe wildfires in Portugal and northwest Spain. Exceptionally heavy rain triggered a landslide in Freetown, Sierra Leone in August, killing more than 500 people. Freetown received 1,459.2 mm of rain in two weeks, about four times higher than average. Heavy rainfall contributed to a landslide in Mocoa, southern Colombia, in April, with at least 273 deaths reported. Many parts of the Indian subcontinent were affected by monsoonal flooding, despite overall seasonal rainfall being near average. The most serious flooding occurred in mid-August in eastern Nepal, northern Bangladesh and nearby northern India. Mawsynram (India) received more than 1,400 mm from August 9-12. Rangpur (Bangladesh) received a month’s worth of rain (360 mm) on August 11-12. More than 1,200 deaths were reported in India, Bangladesh and Nepal, whilst more than 40 million people were displaced or otherwise affected. The World Health Organization indicated that in Bangladesh alone, more than 13,000 cases of waterborne diseases and respiratory infections were reported during three weeks in August, whilst extensive damage was reported to public health facilities in Nepal. Major flooding occurred mid-year in parts of southern China, especially within the Yangtze River basin. Peak totals from June 29 to July 2 topped 250 mm. Fifty-six deaths were reported and economic losses were estimated at more than US$ 5 billion. FAO reported that in Somalia, as of June 2017, more than half of the cropland was affected by drought, with herds reduced by 40-60 per cent since December 2016. WFP estimates that the number of people on the brink of famine in Somalia has doubled to 800,000 since February 2017, with half the country needing assistance. WFP has confirmed that more than 11 million people are experiencing severe food insecurity in Somalia, Ethiopia and Kenya. Many parts of the Mediterranean experienced dry conditions. The most severe drought was in Italy, hitting agricultural production and causing a 62 per cent drop in olive oil production compared to 2016. Rainfall averaged over Italy for January-August 2017 was 36 per cent below average. It was also Italy’s hottest January-August on record, with temperatures 1.31°C above the 1981-2010 average. Other dry areas included many parts of Spain and Portugal. The Democratic People’s Republic of Korea was affected by below-average rains, impacting key staple crops such as paddy and maize. In the Republic of Korea, rainfall from January to June was 51 per cent below average, the lowest since national records began in 1973. An extreme heat wave affected parts of South America in January. In Chile, numerous locations had their highest temperature on record, including Santiago (37.4°C). In Argentina, the temperature reached 43.5°C on January 27 at Puerto Madryn, the highest ever recorded so far south (43°S) anywhere in the world. Exceptional heat affected parts of southwest Asia in late May. On May 28, temperatures reached 54.0°C in Turbat, in the far west of Pakistan near the Iranian border, and also exceeded 50°C in Iran and Oman. A temperature of 53.7°C was recorded at Ahwaz, Iran on June 29, and Bahrain experienced its hottest August on record. In the Mediterranean, Cordoba in southern Spain experienced 46.9°C on July 12 and Granada 45.7°C on July 13. An extensive heat wave in early August led to temperature records in northern and central Italy, Croatia and southern France. California had its hottest summer on record and extreme heat affected other western states. This culminated in a major heat wave at the end of August and early September, which included a record high temperature (41.1°C) at San Francisco. Extreme heat and drought contributed to destructive wildfires. Chile had the most significant forest fires in its history during 2016-2017 summer, after exceptionally dry conditions during 2016 followed by extreme heat in December and January. 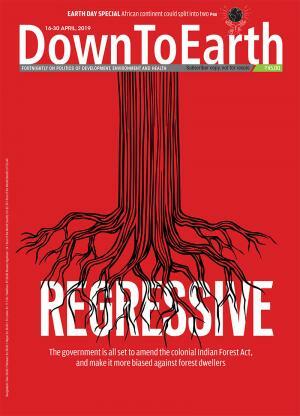 Eleven deaths were reported, and a total of 614 000 hectares of forest were burnt, easily the highest seasonal total on record and eight times the long-term average. There were also significant fires during the 2016-2017 Southern Hemisphere summer in various parts of eastern Australia and in the Christchurch region of New Zealand, whilst the southern South African town of Knysna was badly affected by fire in June. It was a very active fire season in the Mediterranean. 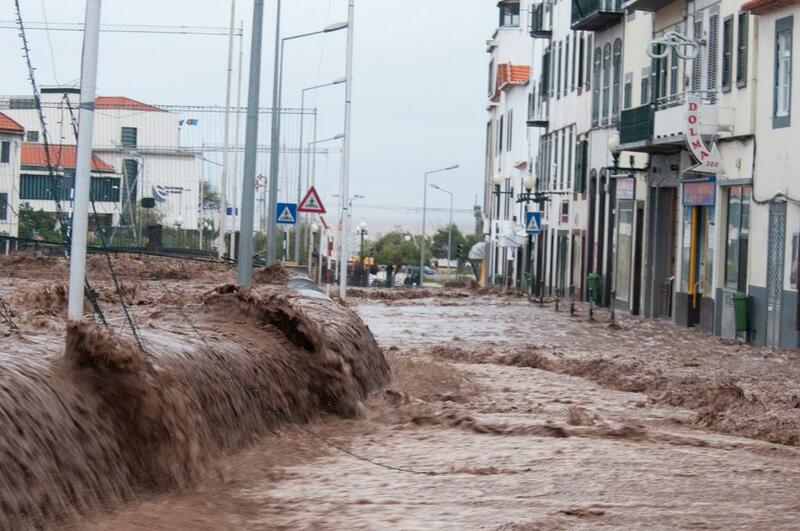 The worst single incident occurred in central Portugal in June, with 64 deaths. There were further major fire outbreaks in Portugal and northwestern Spain in mid-October, exacerbated by strong winds associated with Hurricane Ophelia. Other significant fires affected countries including Croatia, Italy and France. The area burned in the contiguous United States from January to 19 October was 46 per cent above the 2007-2016 average. The area burned in the western provinces of Canada was about eight times the 2006-2015 seasonal average and contributed to heavy smoke pollution. A wet winter, which allowed the heavy growth of ground vegetation, followed by a dry and hot summer, provided ideal conditions for high-intensity fires in northern California in early October. At least 41 deaths were reported, the worst loss of life in a wildfire in the United States since 1918. Severe cold and snow affected parts of Argentina in July. After heavy snow had fallen the previous day, the temperature reached −25.4°C in Bariloche on July 16, 4.3°C below the previous lowest temperature on record there. Other regions where record low temperatures occurred in 2017 included some locations in inland southeastern Australia in early July, where Canberra had its lowest temperature (−8.7°C) since 1971, and the Gulf region in the Middle East in early February.